Nowadays, most Customs administrations have a school which teaches Customs staff. Some have a training centre devoted to the continuous practical training of officers throughout their careers. And it is one of these centres and its crucial role that is examined in this article, the purpose of which is to provide food for thought about training and the future prospects offered by technology. The courses run by the Customs school make it possible to acquire the knowledge required to exercise the profession and to explore the theoretical aspects of various subjects to be mastered. However, their practical and operational aspects can be explored to only a very limited degree. According to Kees Visscher, the Manager of the Netherlands Customs National Training Centre responsible for the maritime and land sector, there is a real challenge when it comes to building skills, that is to say the ability to act effectively in a defined situation, an ability which draws on knowledge, but is not reduced to it. Kees speaks from experience. Before taking over the Rotterdam training centre, he had held various managerial posts, including being responsible for training and coaching management staff working at the port. The years spent training staff led him to conclude that Customs officers in the Netherlands display very varied levels of skill. Whilst some exhibit great abilities, others lack know-how, which clearly affects the quality of their daily work. Early on, Kees came up with the idea of setting up a training centre which would make it possible to transfer operational know-how and assess officers’ skills and conduct. In 2004, a colleague returning from a visit to the Halifax training centre in Canada described the centre and its facilities. Kees realized that his dream of creating such a body in Rotterdam could become reality. 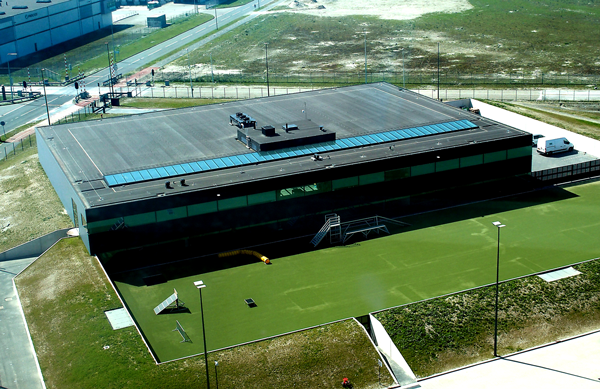 The Directorate General subscribed to the idea, and the Rotterdam Regional Training Centre was established in 2006. Trainers are recruited from serving Customs officers according to their motivation and ability to communicate and to use their imagination and innovate, as well as qualities such as their dynamism, common sense, and consideration for others. Playing out real-life situations is an essential part of the training, and trainers have to develop role-plays and practical exercises in which they themselves take part. The recently established centre has a computer training area. Outside, a row of containers is used for various exercises, but the climate is harsh in the Netherlands. Kees is, therefore, starting to think about building a new structure which would make it possible not only to train Customs officers whatever the weather conditions, day or night, but also to school them in an environment which reproduces real working conditions as closely as possible. They could also be filmed during the exercises developed by the team of trainers to make the post-training evaluation sessions more interesting and effective. A detailed analysis of the plan has been drawn up and submitted to the Directorate General. Work begins in 2014 and, although there is a little left to be done, the first training programmes have been under way since the end of 2017.
an entire space which reproduces the various “rooms” of a vessel: crew quarters, a Customs store, a captain’s meeting room, and an engine room. The various rooms are equipped with video cameras and a sound system, which make it possible to create a realistic sound atmosphere. In the engine room, in addition to the engine noises, the temperature can rise to 30 degrees. The cameras make it possible to follow the training from the control room, study the behaviour of the participants as closely as possible and, once the exercise is over, show them the images, if necessary, during the debriefing. The trainers, who must constantly keep up to date with methods of concealment and operating procedures in order to develop credible scenarios, have a workshop where the equipment necessary for the training is made: hiding places, labels, and reproductions of objects or at least their shape. A 3D printer is amongst the recent purchases. It will make it possible to reproduce objects that are difficult to obtain, such as, for example, the skull of an endangered species of monkey which could be placed in the crew quarters. Part of the building is reserved for the Dog Handling Training Centre, which has a huge outdoor area as well as an indoor area for substance detection training, and a room reproducing the inside of a house to teach the dogs how to move around in such an environment. The departure of the United Kingdom from the European Union will have effects on the Customs activities of the Netherlands. It is estimated that Customs declarations for exports to Britain will increase by 4.2 million and import declarations by 752,000. Netherlands Customs intends to recruit and train new officers, some of which will pass through the training centre in the coming months. In addition to these new recruits, all the Customs field officers and technical experts working in a port environment will have to undergo four days of training at the centre every year. The centre will also be able to welcome foreign delegations and continue to collaborate with the WCO, as part of the Container Control Programme jointly run by the United Nations Office on Drugs and Crime (UNODC) and the WCO, for example. Kees is now considering using virtual reality and augmented reality. These two technologies are different. Whilst virtual reality creates total-immersion simulation, augmented reality superimposes on the real world 3D images, captions and other elements which improve the user’s perception of his/her environment. Virtual reality technology has proved to be a major asset for certain industries such as the health and oil industries. Oil companies have started to use this technology to train their employees to operate on oil rigs. Hospitals use this technology to guide practitioners in procedures such as cardiopulmonary resuscitation or the insertion of Foley catheters. A computer, some sensors and a helmet would be enough to be transported to a warehouse or a port terminal, or even to Madagascar to discover the flora and fauna there. To demonstrate the relevance of the idea, Kees organized some defensive gun training for a group of Customs officers responsible for carrying out house searches with the aid of a 360 degree simulation developed by a private company in collaboration with the Netherlands Ministry of Defence and the Netherlands Organization for Applied Scientific Research. The Customs officers found the training very effective and very realistic. Although they are already properly trained, they felt rushes of adrenaline during the exercise. The technology offers the possibility of viewing the images again for analysis, replaying them as often as desired, and developing a multitude of scenarios and environments. Moreover, in the case of gun training, no safety issues arise, and there is no need to buy any bullets. One of the obstacles to this technology is its cost. Virtual reality devices are still relatively expensive and require the use and installation of computers with powerful graphic cards. What is more, developing a virtual reality training system is expensive in itself. There are also other concerns. The technology still faces the difficulty of reproducing the sense of touch and force feedback, and the devices can disorientate users who may feel slightly nauseous after using virtual reality devices. As regards augmented reality, it is possible to train officers for certain tasks, such as vehicle inspection, more easily. Each part of the vehicle can be visualized from all angles and removed with a hand gesture. Like many people, Kees is persuaded that the technologies of virtual reality and augmented reality will play a major role in the training of tomorrow. He is currently working on putting together a business case to find the funds necessary to develop a small virtual reality game that would serve as a pilot. Any administration or organization interested in participating in his endeavours is strongly urged to contact him.